In our all-new Design Focus series, our designers share their inspiration behind great, Liv-able interiors. 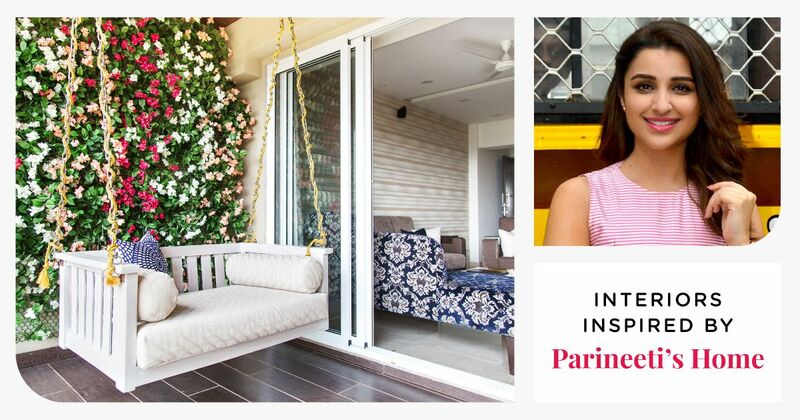 In this edition, Livspace designer Avneet Kaur Hanspal gushes about designing a modern Mumbai home with French sensibilities and her incredible experience of learning to design for an autistic child. Who knew Marie Antoinette’s remarkable style and au courant design could come together to create something beautiful. Reminiscent of the 18th century French interiors but with a contemporary touch is the Gupta’s dream home, aptly named Shantiniketan – an abode of peace. 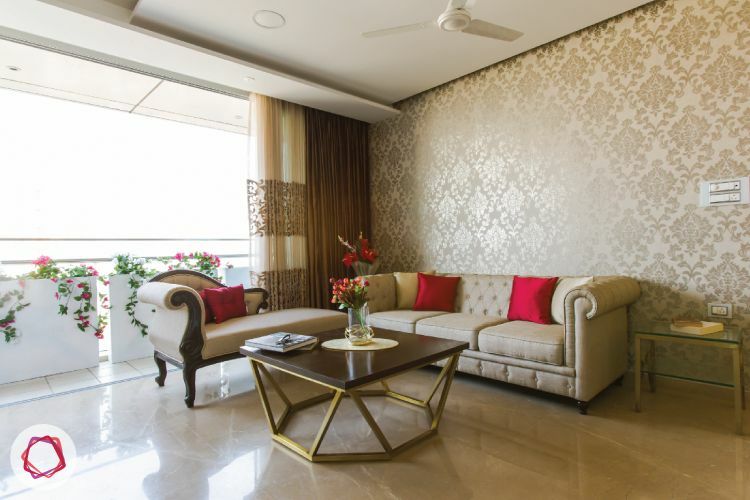 Shankar and Mahua Gupta were ecstatic when they booked their apartment in early 2011, nestled in the suburbs of Goregaon East, amongst a thick, green landscape of rolling lawns and pretty gardens at Oberoi Exquisite, a name now synonymous with luxury. 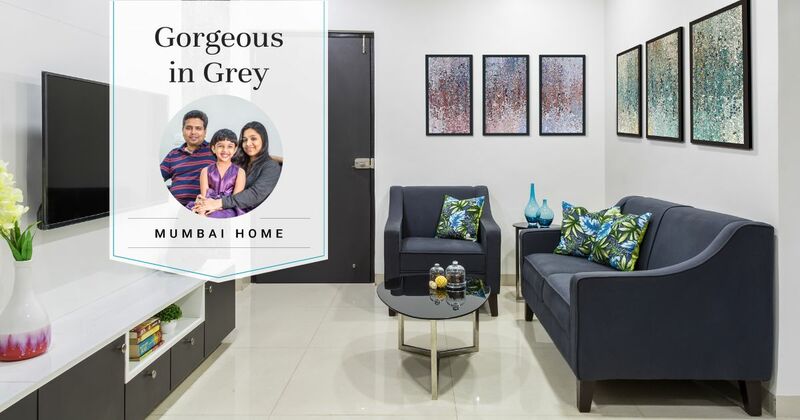 It was perfect because they wanted to stay in the neighbourhood that Mihika, their 14-year-old autistic child is familiar with. 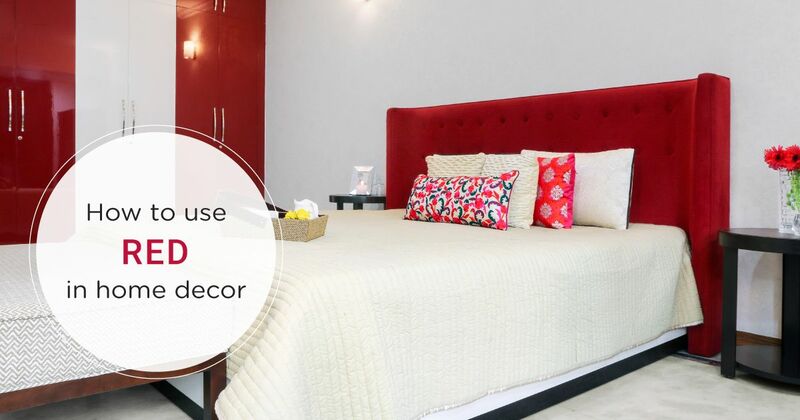 When they met Livspace designer Avneet Kaur, they were immediately struck by her zeal to do good work. 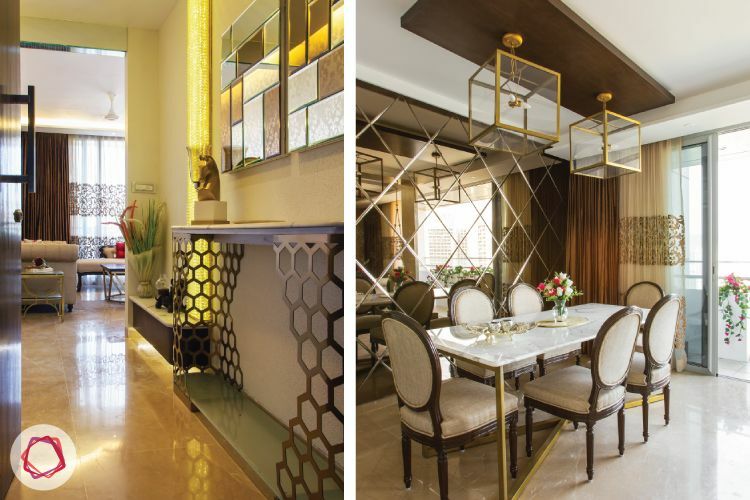 Avneet, a connoisseur of all things Marie Antoinette, would then go on to cast a spell of luxury not just across their home, but their lives as well, with pastel shades, opulent motifs, and subtle hints of gold. 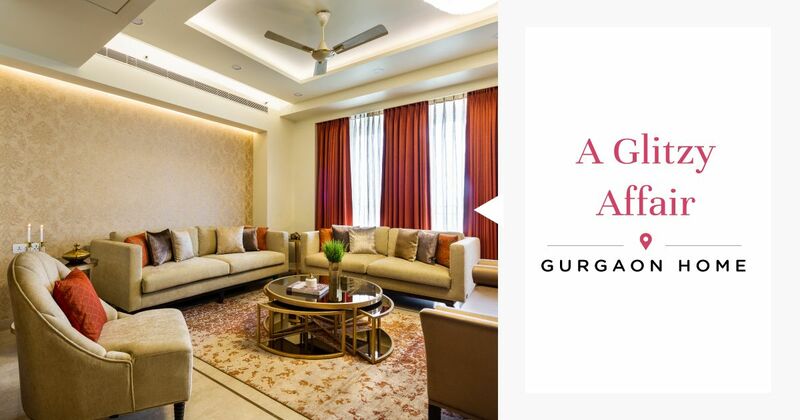 We sat down with Avneet over coffee to talk about the Gupta’s spectacular retirement home. First off, let me just say, the house is absolutely stunning, and you’ve experienced the response first hand from anyone who’s seen it. What excited you the most about this project? Avneet: Thank you so much! 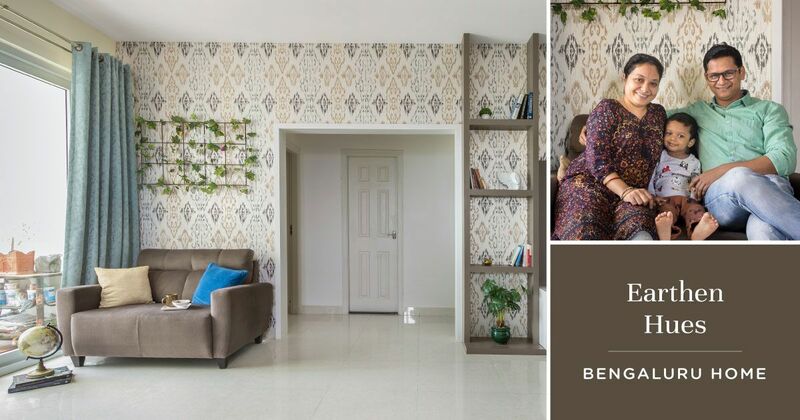 I was excited to work on this particular home, mostly because of Mihika. I remember, when I made the pitch, I was extremely emotional when we began discussing her room. The Guptas were very receptive to all my ideas, and I think as a designer we rarely get such trusting clients – that really helped open me up, creatively. Tell us a little about the Gupta family and their design requirements that became your brief. Avneet: Shankar and Mahua live with Shankar’s 74-year-old mom, Hena Gupta, and their 14-year-old autistic daughter, Mihika. Shankar is the president of one of the world’s largest capsule manufacturers, while Mahua does a lot of work with mothers of autistic kids. Their mom is their pillar of support and helps care for Mihika, who currently goes to a special school in the neighbourhood. 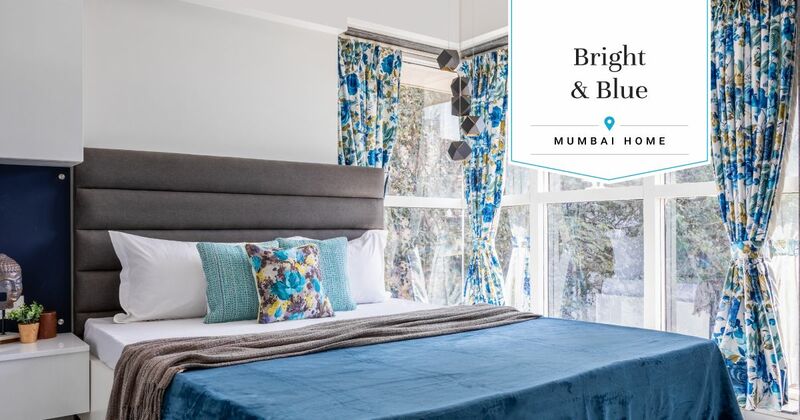 The brief revolved around making a beautiful home that capitalized their vantage view from the 24th floor, and reverberated this sense of tranquility by not obstructing any ventilation. How did you tackle individual spaces? What was your biggest challenge? Avneet: I wouldn’t really say that we had big challenges in terms of space, layout or architecture, save a few complexities. The first thought that crossed my mind when I walked into the apartment was that it could have a long and beautiful foyer. In the original layout, the kitchen entrance was from the foyer; I thought it looked rather odd, bordering on hideous and was glad when Mahua admitted to be of the same mind. We moved the entryway to directly face the balcony, to let in more natural light and aid cross ventilation. Another brain-racker was the distribution board in the foyer. So, we camouflaged it by using multiple pieces of mirrors on a panel. This worked so well, and especially complemented the chandelier that hugs the entryway. 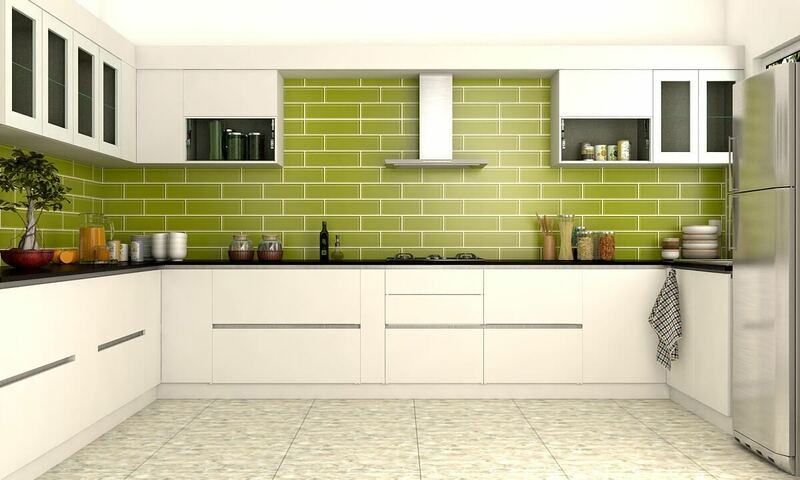 Take us through the process of cementing the overall look and feel of the home. Avneet: Since this is the Gupta’s retirement home, they were very clear about what they were looking for from the get go. Mahua had designed her previous home but in our discussions she said it lacked a professional touch. So, we did a lot of back and forth in terms of inspiration and finally settled on contemporary French and English influences. This largely echoes their aspirations of having achieved the Mumbai dream. And as with most retirement homes, we had to be very careful while designing, and had to constantly remind ourselves about how each member would age in this apartment. 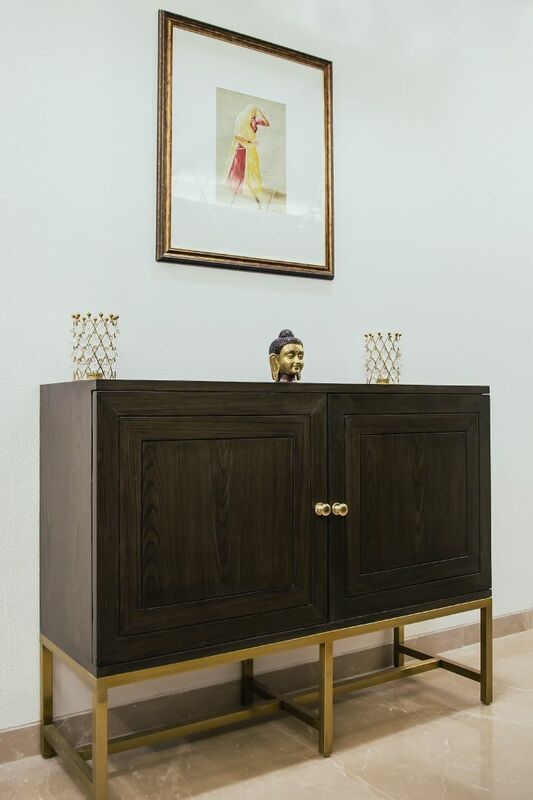 It had to be straightforward-enough for Mahua to go on adding accent pieces as the years roll by, but definitely not bordering on bland because they wanted their home to reflect their prestigious standing in society. Naturally, you must’ve considered how each family member interacts with their personal space. Did the design differ greatly because of this? Avneet: Yes. When I met Shankar and Mahua, everything they told me made me realize they wanted to pay tremendous attention to Shankar’s mom’s little haven, as a thank you. Continuing with the Marie Antoinette flavour, we gave Hena a French boudoir. Given her age, I thought she would appreciate peace and serenity, and felt the mint green walls would really complement the accent floral wall. The standalone, elegant armoire just ties it all together. 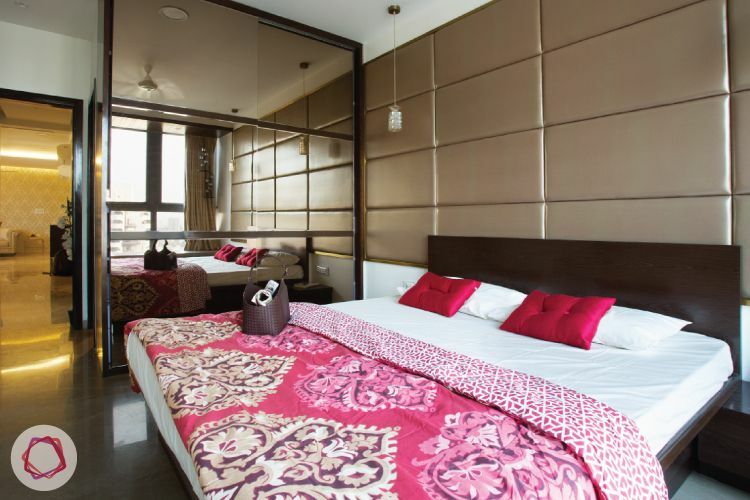 For the Gupta’s bedroom, Shankar was insistent that it should feel and breathe like a hotel. He frequently travels and says coming home can get a little disorienting. 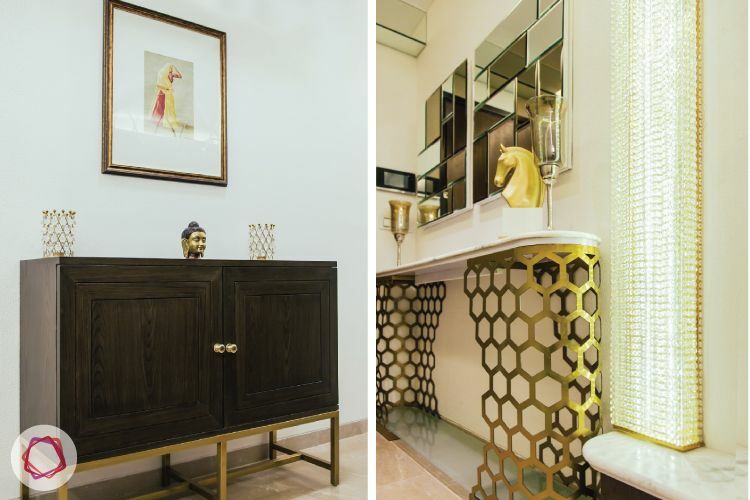 So, in came an upholstered padded wall, the gargantuan mirrors that tower the bed and bounce around so much light that the room appears larger, and an English vanity unit topped with a sterling mirror and an ornate, handmade frame. How did you bend design rules to fit Mihika’s special needs? Avneet: Given the fairly sizeable space of the drawing room, I envisioned a champagne swing to act as a great divider. Plus with their French windows that open up to that splendid view, it was criminal not to have a swing. But keeping Mihika in mind, I ensured that it wouldn’t oscillate too high and built a tiny lock system that attaches the swing to the paneling. We also realized the balcony was a real safety-risk. The railing is at waist-level but the Gupta’s were concerned. So, I brought in tall planters, and sowed a few fake bougainvilleas. Wow, that’s an interesting solve. 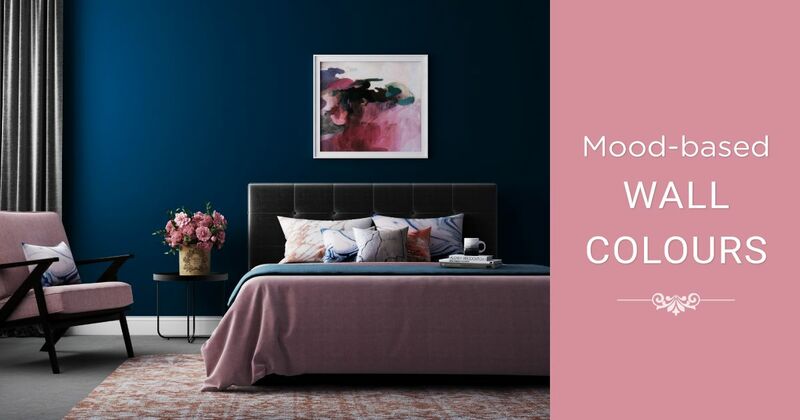 We’ve noticed that you’ve peppered the home with intriguing accent pieces. 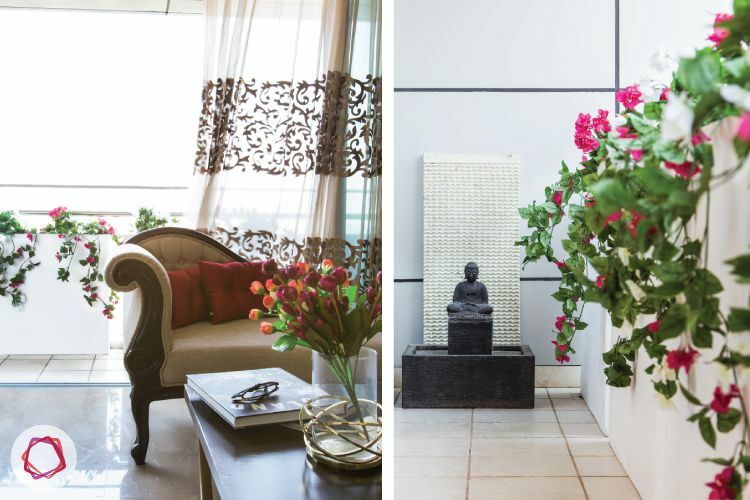 Avneet: I truly believe that great design is elevated by exciting decor. While some of the pieces were retained from their previous home, the Buddha in the balcony, for instance, Mahua was stubborn that most of the others should evoke a certain mood, but more importantly, tell a unique story. Consequently, a few pieces were sourced from Chor Bazaar. And, sure that market feels run-down, but believe me it’s anything but that. The vintage mats that we used in the foyer and on the coffee table, are actually made from mother of pearl – a really rare find. But I’m just overjoyed that Shankar took to a set of exquisite-looking candelabras whose heritage he traced to a Portuguese colonial villa in Goa. It resonated with him thanks to his continuing love affair with all things Portuguese because of his frequent travels to Brazil. So, tell us, which is your favourite decor piece? 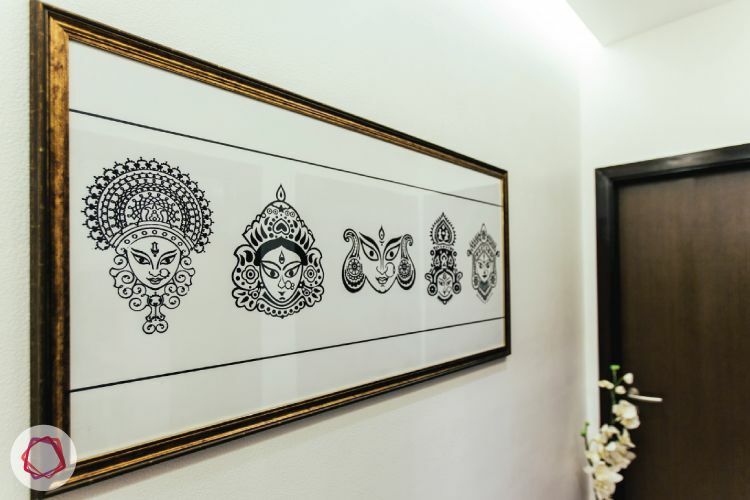 Avneet: It’s the calligraphic Durga prints. 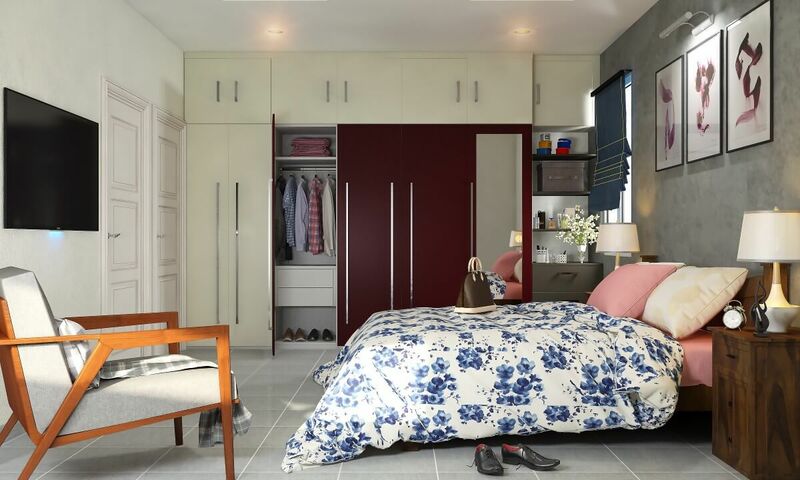 At that point, the project was almost a wrap, and I was yet to find something appropriate for the corridor that connects to the bedrooms. While I was researching ideas, these prints immediately struck a chord mostly because it pays homage to their Bengali roots. So, I thought it would be perfect and got the collage framed. We know this project is very close to your heart. But which space did you enjoy conceptualizing the most and why? 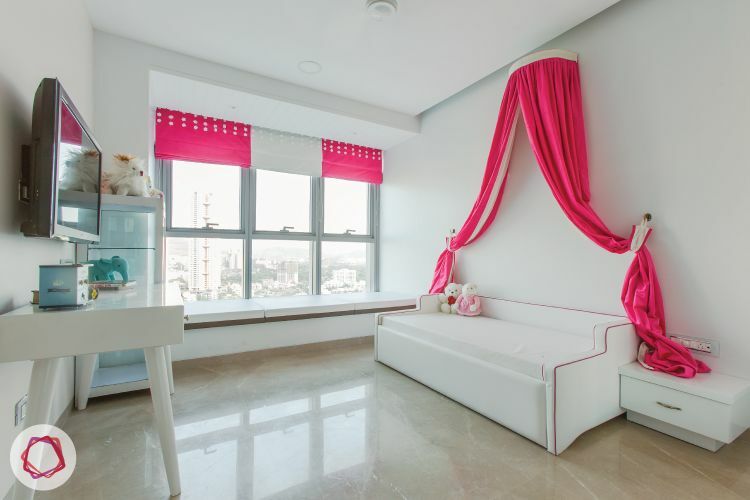 Avneet: Without a doubt Mihika’s room. 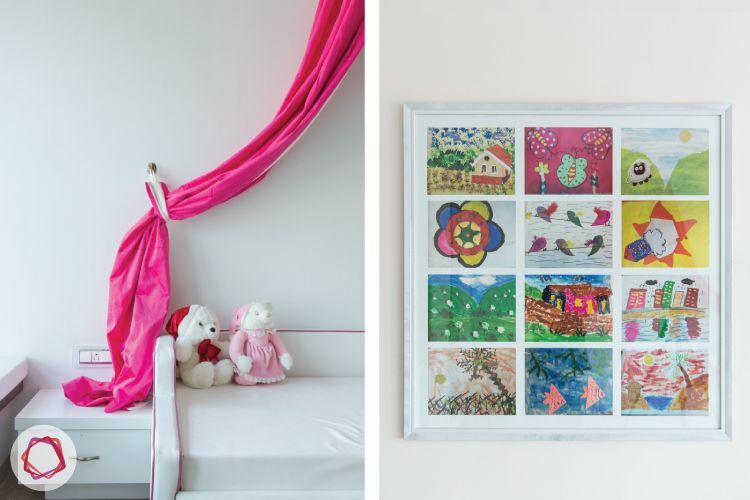 Surprisingly, there exists little to no conclusive studies that deal with interior design for autism. But learning from a few successful experiments across the globe as well as from my conversation with Mihika’s parents, I understood that autism causes one to feel anxious in unfamiliar and complex spaces with a lot of stimuli. So, I chose my elements carefully: the palette is soothing with only a pink canopy and matching blinds introducing a cheerful, princess-like vibe, celebrating Mihika’s spirit to the core; all furniture has rounded edges for little Mihika’s safety as autism can often make one wrongly estimate their own body’s periphery; objects close to her heart — her paintings and toys — are on display to bring a sense of comfort to her room. Familiarity is the reason the Guptas chose a home in Goregaon, the same neighbourhood that Mihika grew up in and I translated the same in her bedroom as well.